Practice along with Karin Otto, E-RYT – a flowing sequence of heart-opening Yoga postures, breathing, and meditation. If you can’t make it to one of Karin’s classes or workshops, this is the next best thing! 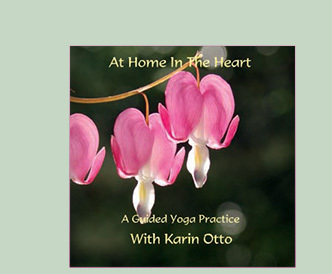 In “At Home in the Heart” Karin offers a full Yoga practice, including Meditation, Vinyasa and a series of back-bending postures, followed by cool down and rest. Enjoy the full hour or choose sections to enhance your personal practice at home. Karin combines challenging, mindful movements, with a loving, heart-centered intention. With her guidance, you can practice going deeply in Yoga postures, while staying rooted in breath and presence. Give yourself, and your friends and family, the gift of Yoga with Karin.